Anyone who's ever owned more than a single credit card is familiar with the pain of paying late fees and getting higher interests because we can't keep track of multiple due dates and live our lives at the same time. If that weren't enough, there's plenty of other kinds of recurring bills that have their due dates scattered all over your calendar. 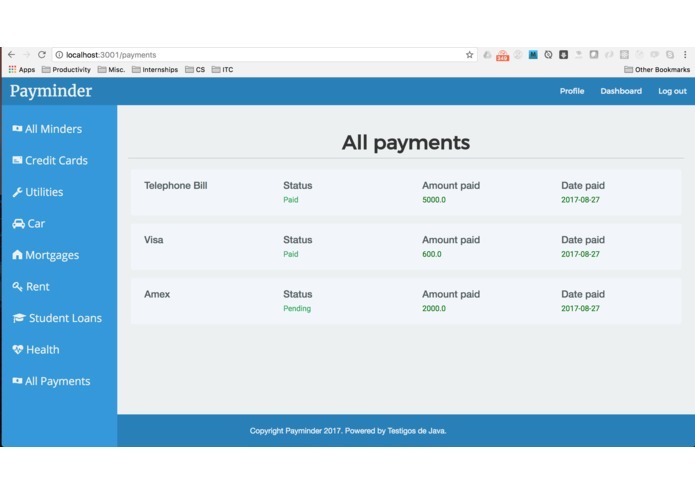 Payminder lets you create '[Re]Minders' for different kinds of payments on some of the most common kinds of recurring expenses. 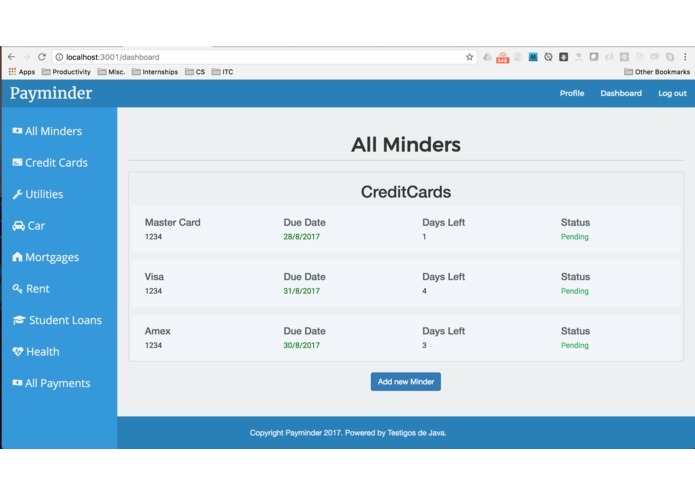 Starting with the ability to keep track of multiple credit cards without submitting any compromising information, Payminder is designed to be a direct reference for all of your scheduled payments in one place. It's quite clear that the reason banks choose not to notify you when you're credit card bill deadline is coming up is because charging you interests and late fees is their entire business model. Payminder helps you circumvent the downside of owning a credit card, or any kind of debt-inducing payment plan (mortgages, car payments, health bills and even your household utilities) by allowing you to create personalized reminders for every credit card, bill and piece of property you're still paying off. 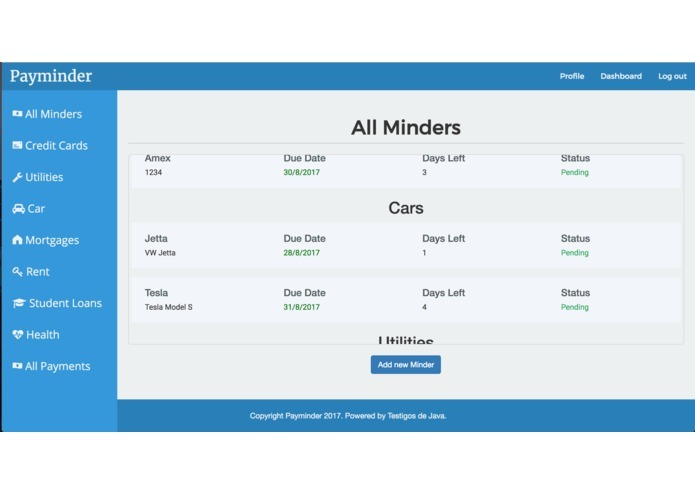 Due to the technical requirements of building the API and both interfaces, along with the tight deadline that comes with every Hackathon, there wasn't enough time to do everything we wanted to. Developing the API took most of our time, and some more time was wasted on trying to deploy it in order to consume it from as many interfaces as possible. 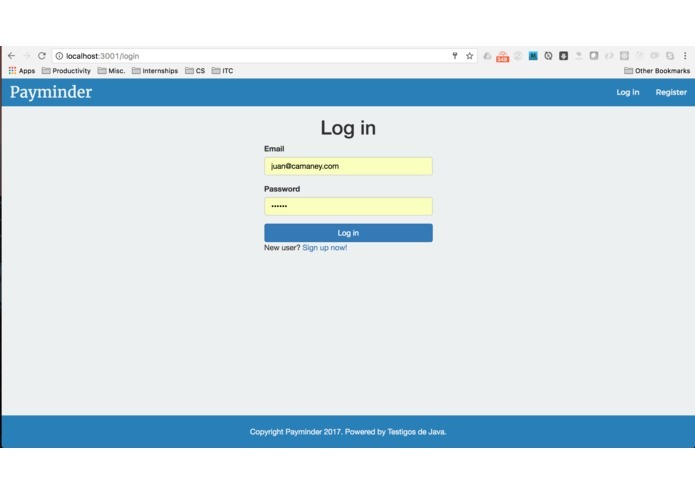 Deployment is a lengthy process, so we decided to instead focus on developing a functional web client that could run locally and consume the API and simply left the Android app as an advanced visual prototype. 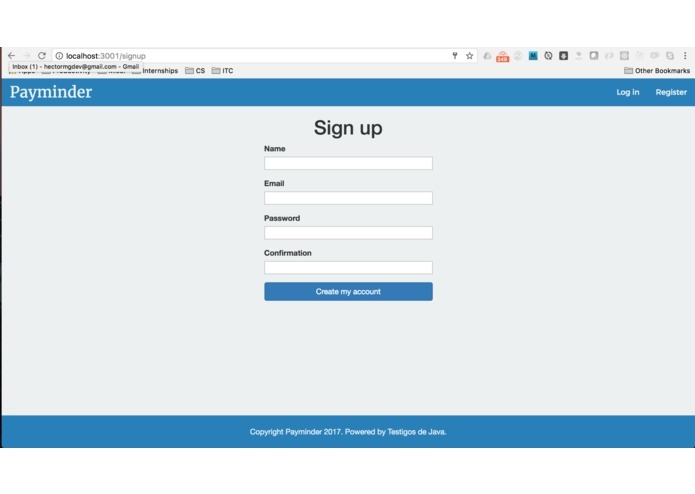 This was all of our first times developing a whole REST API, so we're pretty psyched that we actually got to finish it (with tests and all) and see it in action. We learned it's extremely important to be able to recognize when something's not working out as soon as possible. Wasting time on something that simply won't work in the long run is one of the most regrettable thing one can do at a Hackathon. We also learned that sticking to what we know is no fun and the feeling that comes from overcoming challenges that we set for ourselves is extremely rewarding. Even if our project was a little too ambitious for a 24 hour development marathon, we got exactly what we wanted from it; fun and a ton of experience. Hopefully we'll be able to polish our API, implement some versioning and have at least two fully working interfaces (web client and Android app) to show off. Ideally, Payminder could actually help people save some money and most importantly, have a little less stress and anxiety in their lives. I worked full stack on this project. I was deeply involved with the whole API design and coding, as well as the UI design and implementation.